The DiscoveRap should work from 12..24V DC. There are 3 voltage/power levels on the board. We have 3.3V for the STM32 Discovery Board, 12V for the fans (hotends, case) and the unregulated power supply voltage 12..24V for the heaters (bed, hotends). To make it most efficient i decided to use 2 switching regulators. One for the 3.3V and one for the 12V. To make life easier the 12V are only 11.3V so a buck converter instead a buck/boost can be used for it. 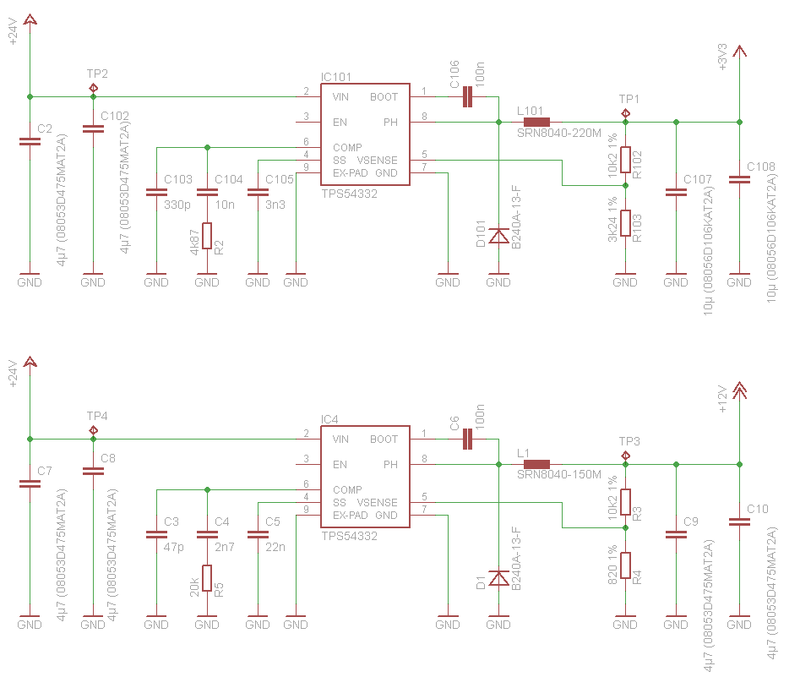 Both switchers use the same IC, only the component values differ a little bit depending on the output voltage and startup time. The 3.3V start a first and approx. 10ms later the 12V are ready.